Abstracts should be single-spaced, written in Times New Roman in Word doc or docx format (B5 page size). Abstract should consist of a concise title (bold, font size 12, capitalised first letter of each word, max 20 words), full name of author(s) and correspondence in font size 11, affiliation(s) of author(s) italicised in font size 10. Presenting author’s name should be in bold. Corresponding author should be indicated with an asterisk (*). A minimum of 3 (up to 5) keywords must be provided in alphabetical order separated by (;) in font size 11. Abstract should have a concise background of study, objectives, methodology, results and discussion, formatted according to publication standards and not exceeding 200 words. Please use the abstract template. Please take note that Abstracts scheduled for poster presentation will be grouped by sessions and program number. Kindly follow the guidelines provided below for the preparation and display of your poster. Size of the poster should be printed as A1 (23.4 x 33.1 inch) in portrait orientation. The Poster number will be mounted on the top of the board by the conference staff. On the day your poster is scheduled, it should be put up before the mentioned time of the poster session. Be sure to include the Abstract Title, Authors’ names and Affiliations at the top centre of the poster. The lettering for this section should be at least 1 inch high. 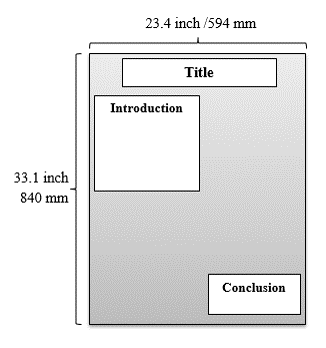 Use the headings “Introduction/Overview, Methods, Results, Conclusions” to identify the poster layout. Use a large printing font (20 point or larger) for the primary text and an even larger font for headings. Make your poster visually pleasing and attractive. The use of PowerPoint can be helpful in creating your poster.